Well - another trip is fondly stored in the memory bank. and arrived home Thursday about 2pm. We spent 3 nights enroute. Mayberry Campground in Mt Airy NC. a 4 hr jaunt to the barn. 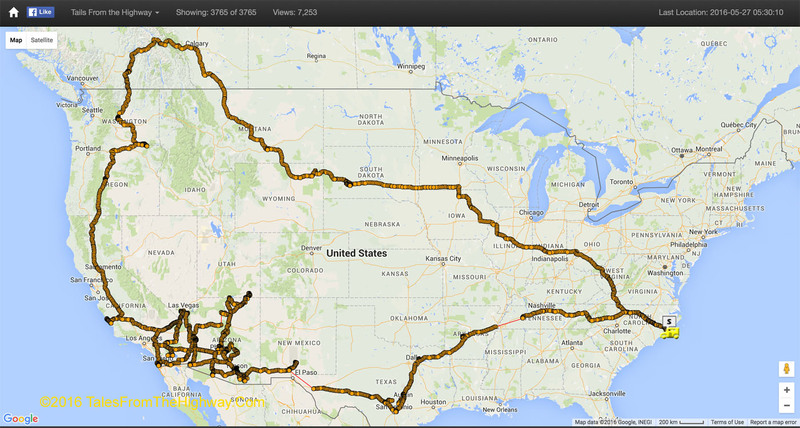 A map of our route from SD to NC - about 1,800 miles for the last legs. Thru Indiana, Ohio, and past the Capital of West Virginia in Charleston. Thru Virginia and into NC. traffic that would be on the road. As it turned out traffic was still pretty heavy. to the Cedar Island Ferry. 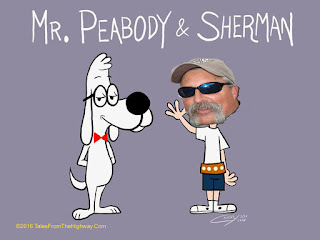 I had the assistance of Mr Peabody to help me with trip planning. 7 months on the road. 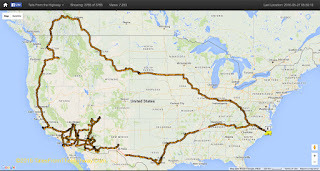 I selected 8 months which shows our route. Beyond the numbers however lies the real story. The joy of beautiful nights around the campfire with great friends. The Broncos winning the Superbowl. The places we visited and traveled to with our good friends from all over the world. visiting these places all the more special. I am kind of in new territory now with no firm plan for our next trip. I want to get back to Alaska but to do so I really need to set out from here to go there. to head north - we have been traveling for many months (6 or 7) are ready to start heading home. Probably a trip to Red Bay for some slide out maintenance. And I'm sure the travel bug will get me for some other idea. and keep you posted along the way. Happy Trails and see you down the road. Since our last post we have put about 1,000 miles on the odometer. at the Devils Tower KOA located at the foot of the Devils Tower. that we met some good friends for the first time. added an element of drama to this unique scene. west side of the National Park for two nights. It has 50a hookups only - no water or sewer. Today we took a sunday drive thru the park. East along the Scenic Loop to Wall, SD then the interstate back. The badlands are heavily eroded and continue to erode at about 1" per year. Even though it was mid-day, some of the colors popped. We spotted some Dall Sheep in the Eastern end of the park. seen signs for Wall Drugs. The signs start hundreds of miles before you get here. Since we were passing by on the way back to camp we stopped in to check it out. and their control center - now administered by the National Park Service. 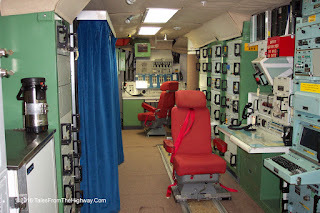 We first visited the D-9 missile silo. so that you can look down and see the missile inside. workers could climb down to perform service. Looking down thru the glass into the silo. 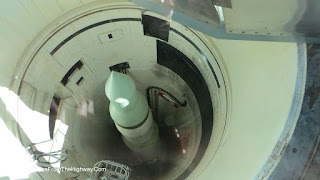 The minuteman missile sitting there in its launch position. About 7 miles east we next visited the Launch Control Center. and if called upon, launch the missiles. An average LCC would control 10 minuteman launch sites all located about 5-7 miles away. Above ground it looked like a simple ranch house type building. All of the missile sites and LCC's were monitored with various security measures. Unauthorized entry could mean death! Banff National Park to an almost empty campground. The temperature was just about perfect. but the name is a misnomer... This is no trailer court! All the sites are long pull thrus on each side of the road. We were parked a few spaces down on the right. The views from the campground are beautiful. Everywhere you turn is a mountain vista. but we did manage to get out late on our last afternoon for a break. Canadian friends as tour guides. Below - the Banff Springs Hotel is a local landmark. by the Canadian Pacific Railway to create more passenger traffic. A quick shot of the two of us. are not really into it. 2 or 3 months to that, and we are both ready for a change. home and put the Yukon and beyond back on the shelf for this year. make the trip back up there next spring. Boating, the smell of the Ocean and summer life on the coast. and who knows what we'll see along the way. The Lincoln Presidential Library is on the list. territory since my last post. From Kelowna to Banff National Park, Alberta. while Kate flew to Chicago to visit her BFF Mary. Lincoln rock is just outside of Wenatchee Wa at the eastern base of the Cascade Mtns. My site had full Hookups and 50amp service. Kate is out of town. bouncing around the desert in the winter time. they were anxious to show her off as well as show us their home town. across from Kelowna and only about 10 min from Pat & Robs house. and we enjoyed the heady mixture of pine, roses, and campfires. Pat and Rob brought their Montana over to the park and camped with us for 2 nights. One morning headed to town we had a herd of Dall Sheep right outside the park. We enjoyed lunch and 2 dinners at their lovely home and got a taste of BC hospitality. Saturday afternoon we strolled along the wonderful waterfront park. enjoying the warm sunny weather. At one point we had 5 doodles all rubbing noses. We must have met a dozen doodles walking along the waterfront. The town has a wonderful international feel to it. Walking the park you see people from all over the world. Kate and I both fell in love with this beautiful Canadian city. We watched this guy getting lessons on this water powered hoverboad. After numerous failed attempts he finally got into the air and hovered for about 20 seconds. Next week he might be flying high! Our first night was steaks on the Grill. Our second night we had this wonderful ham cooked on the grill. from the Sound of Music and Scottish Dancing. Dinner and a show. How do you beat that! Thanks so much R&P for your hospitality and friendship. We both had a wonderful time and already are talking about when we can come back. 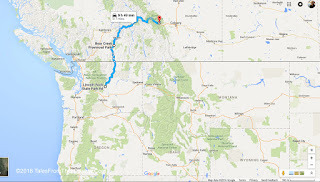 the Canadian Rockies to our next destination - Banff National Park. The weather was perfect for a drive thru the mountains. A few photos while riding thru Glacier National Park. We are now in Banff National Park at the NP Campground. Its a pretty campground, full hookups with 30amp at about 5,000' elevation. We are starting to sense the longer days as we move further north. only going to continue until I'm saying the same thing about midnight. the Icefield Parkway to Jasper NP. Dawson Creek BC and mile Zero of the Alaska Highway. some pretty shots of the beautiful scenery here in Banff next time. A week ago today we left Cambria, Ca and started our trek northward. Walla Walla Washington for our annual spring wine tasting. renewing acquaintances with some of the finest people that we know along the road. Arrive Thursday.... Have Happy Hour with the gang. Friday wine tasting and pot luck dinner. Saturday morning Farmers Market, Wine Tasting, and dinner at Tim & Genes new home. Sunday - pot luck breakfast, wine tasting, Steak night at Merikays and Rons place. Headed northward on I-5 in California you cross over Shasta Lake. effect on the lake level. Here is what that crossing of the lake looks like now. at the RV Park so we wall went to Merikays and Rons house. Merikay and Ron are no exception. Their beautiful backyard has a very peaceful feel to it. Saturday night we went to Tim & Genes new home on the outskirts of town. They have done an amazing job turning it into a beautiful country retreat. Here Kate poses with one of our hosts - Tim. Perfect hosts - Tim & Gene set a long table out in the yard. We ate dinner overlooking the vineyards, wheatfields, and Blue Mountains in the distance. A perfect setting. A perfect meal. 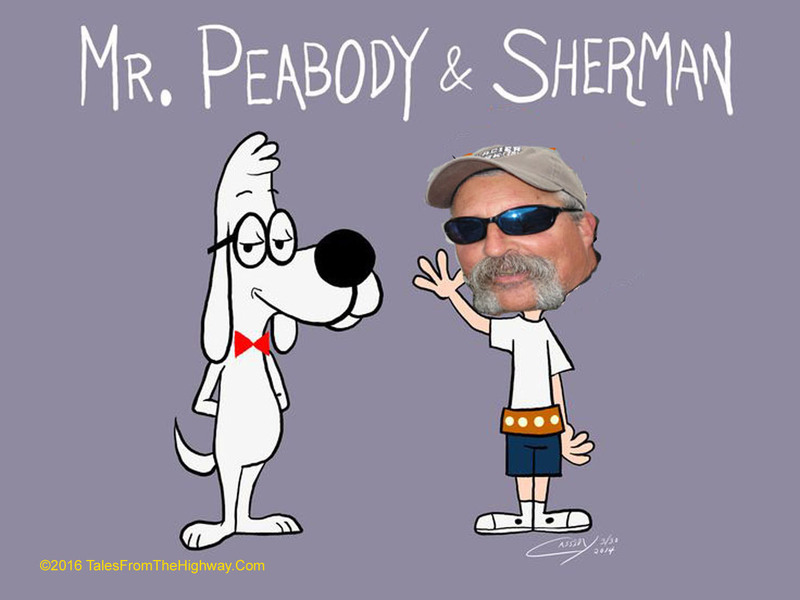 and Perfects Hosts. Kate poses in the vineyard. Another view of the yard and table. This years Sangiovese grapes on the vine. Sangiovese is the grape used in Chianti and other Tuscan Wines. forest service roads in the Blue Mountains. especially since we had no cell coverage. So we retreated back down the mountain. country, several thousand feet below us in the left background. Sunday night we had steak night at Merikays house. Here is a photo of the group for that dinner. warmth and hospitality of all that we have had the privilege to meet here. and treated us like family. Its a special place and a special bunch of people for sure. 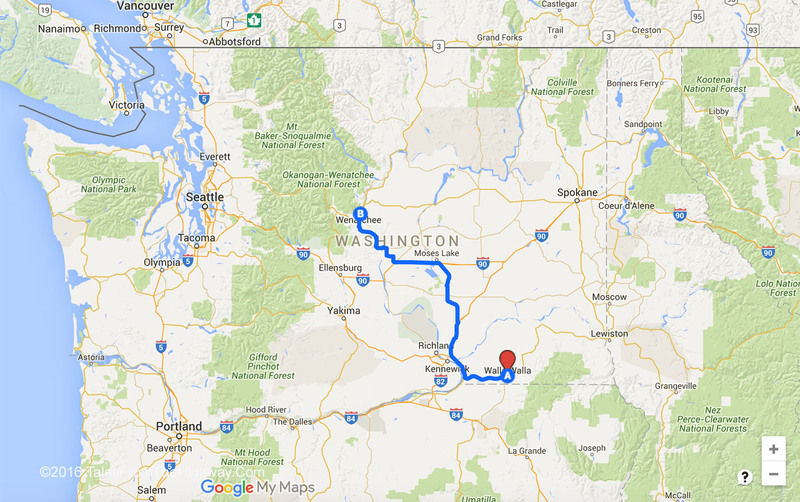 Today we said good by to Walla Walla. 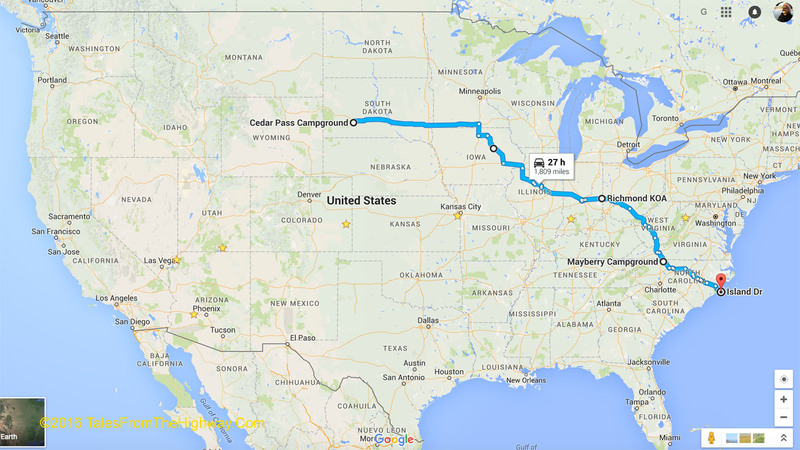 and our eventual journey to the Yukon and beyond. and this year is the same. 50amp and full hookups makes is a convenient jumping off base. 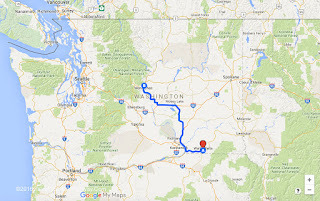 My trip today from Walla Walla to Wenatchee. 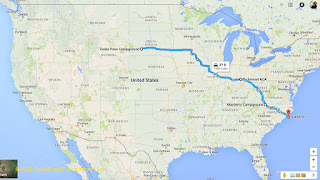 Our plans after Kate gets back is to head north. I'd like to at least get to Dawson City in the Yukon again. If we make it to Alaska fine.. if not no big deal. Dawson City is only about 50miles from the Alaska border anyway. I'm looking forward to getting back in White Birch Country.